The Supreme Court of Georgia adopted the Jury Composition Rule (“the Rule”) to effectuate the Jury Composition Reform Act of 2011 (“the Act”), Ga. L. 2011, p. 59. The Act was the product of a seven-year effort by this Court’s Jury Composition Committee, led by then-Justice Hugh P. Thompson, to develop recommended changes to OCGA § 15-12-40.1, related statutes, and the Unified Appeal Procedure used in death penalty cases in order to provide a modern method of preparing the lists from which local courts select grand juries and trial juries. Prior to the enactment of this rule, which became effective in 2013, each county utilized so-called “forced balancing” in an attempt to make its jury lists include men and women and certain identifiable racial groups in proportion to the county’s population as determined by the most recent decennial census. See Williams v. State, 287 Ga. 735, 735-736, 699 S.E.2d 25 (2010), superseded by the Act as noted in Ellington v. State, 292 Ga. 109, 118 n.2, 735 S.E.2d 736 (2012). In some counties with fast-changing demographics, the process left those proportions in the jury pool significantly out of line by the end of the decade. See id. 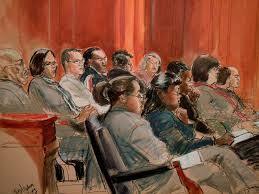 at 738-741, 699 S.E.2d 25 (Melton, J., dissenting) (criticizing the disparities authorized by the old process). See also Fitch, supra, at 13-14, 16-18 (describing forced balancing and its problems). It was widely believed that the old way of “forced balancing” jury panels in Georgia was unconstitutional. The new Jury Composition Rule sought to eliminate that concern and bring the process of selecting jury panels into constitutional norms. In Ricks v. State, No. S17A0465 __ Ga. ___ ( May 15, 2017), a criminal defendant who was indicted for murder, armed robber, criminal street activity and other crimes was given notice by the State that the State intended to seek the death penalty in the case. Defense Counsel then filed a motion asking the Fulton County trial court to issue an order declaring the manner in which Fulton County selected trial jurors to be in violation of the new Georgia Jury Composition Rule. The trial judge denied the motion and the defendant appealed. Testimony in evidentiary hearings showed that since 2012, the Clerks Council has provided Fulton County with a county master jury list of eligible jurors on July 1 of each year, and the Council’s executive director confirmed in his testimony that the Council has followed the Jury Composition Rule’s mandates, including removal of names based on data regarding felons and deceased persons and based on the counties’ exception lists; detection of duplicates using the detailed algorithm provided in the Rule; and detection of unusable or changed addresses through the National Change of Address database; however, rather than choosing venires from the county master jury list that the Clerks Council provides, as OCGA § 15-12-40.1 (g) directs, Fulton County produces its own jury list using a complicated process developed by its vendor based on outdated guidelines set forth in a local jury management order issued by the chief judge of the Superior Court of Fulton County. The evidence showed the private vendor hired by Fulton Co. would then use its own electronic method to strike numerous jurors who had similar enough names to other jurors who were known to live outside the county, or to be now incapacitated in some way or ineligible in Fulton County someway. Thus, this private electronic software vendor was taking the official juror list and removing names from it without any authority whatsoever. The Supreme Court ruled this to be inappropriate and that Fulton County had been, in fact, violating the Jury Composition Rule in the manner in which it summoned jurors for trial. For Mr. Ricks and others being tried in Fulton County, that means from today forward jury panels should have a more diverse representation. It means that a private software vendor cannot simply pick and choose which names from the official jury list to remove on a whim. This will restore integrity to our entire jury system, both in criminal and civil cases. I don’t know how, and there was no discussion of how in the Ricks opinion, the capital defender, which is the defense team in Georgia that defends all criminal defendants against whom the death penalty is being sought, discovered this illegal method of removing names from the official jury lists in Fulton County was being done. That would make for an interesting story over cocktails for certain. But there is little doubt that after all the effort and time put in by various members of the Georgia Supreme Court, especially the former Chief Justice Hugh Thompson, into rewriting the jury composition law to ensure the jury panels were constitutional, they would not take the opportunity to protect the newly enacted law when it was first brought to the Court’s attention it was not being followed by Fulton County. Perhaps the real question here would be who in the Fulton County judicial administration thought it would be okay for their private vendor to redact the official jury list as only they saw fit? And perhaps an even more pressing question is why did the State attempt to defend this conduct?